Can you imagine eating a bumble bee? My Dad accidentally did that years ago (I need to blog that story) at a Church picnic. I always wondered if it was like eating a prickly pear cactus even though Dad said it tasted like pepper. In this post, I share some creative facts about the prickly pear cactus. Opuntia humifusa, otherwise known as the devil’s-tongue, eastern prickly pear or Indian fig, is a cactus native to parts of eastern North America. I’ve seen this plant in Ohio, New Mexico, Nevada, and the Munich Botanical Garden in Germany. 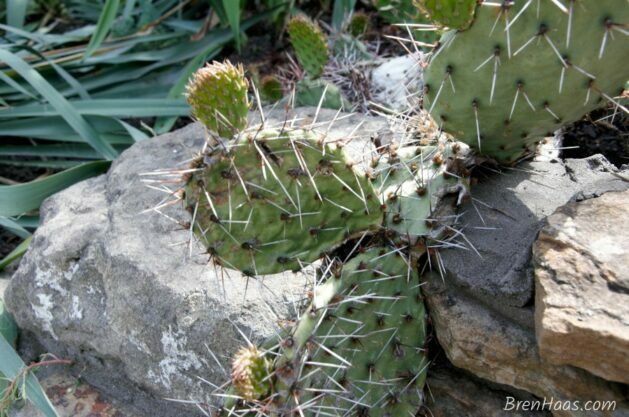 Officially, the prickly pear cactus can grow in hardiness zones as low as 2. I am not fond of its prickers especially out in the wild. However, I do like it fried in Mexican food. To clarify any confusion about prickly pear cactus I’ve put together this informative list. In case you need more information about this plant you are encouraged to check out the reference links at bottom of this list. Even though the Prickly Pear Cactus is Protected by sharp spines it is actually a tender and delicious treat. The first time I saw cactus used for recipes was at the Mexican market in Toledo Ohio. I brought some home to fry up and use in tacos. This family contains about 1,800 species most all are can be found today. The Prickly Pear Cactus can survive the freezing temperatures of the north because of special antifreeze chemicals in its cells. Flowers are produced at the ends of pads in early summer. Mine bloomed within a few weeks of planting the cuttings I received at the Wood County Plant Swap. The plant is protected out in the wild by law so do not disturb if you see growing in the desert. Hard to believe you can grow such a fascinating plant from seed but it is true. 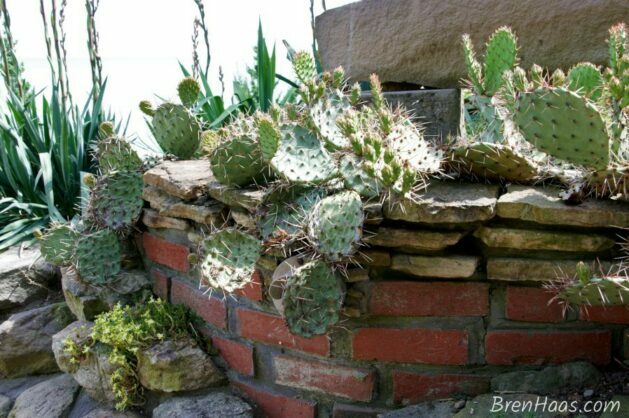 It is much easier to propagate from pads of the prickly pear cactus. Simply but very carefully, cut a pad that is at least six months old. Allow the pad from the cactus to form callus. This process may take a week in warm weather and longer when the air is moist. When planting the pad, settle it upright about an inch deep in a well-drained medium. A mixture of equal parts of soil and sand or [eafl id=”29905″ name=”15lb. Bag Garden Pumice (Pumice, 1/8′ stone)” text=”rough pumice”] is recommended. Planting the pad too deeply will encourage rot. Once the plant is established you can water it. After the first watering let the plant remain dry in full sun area. I couldn’t do a post on this plant without sharing the first time I spotted this cactus growing in Ohio. I couldn’t believe my eyes in Cleveland Ohio During the APLD tour 2014. APLD is short for the Association of Professional Landscape Designers. I had the honor of touring with them during their annual event in Cleveland Ohio. I literally had to pinch myself a few times during this amazing tour because it didn’t feel like I was in my home state of Ohio. Prickly Pear Cactus growing out of the stone. 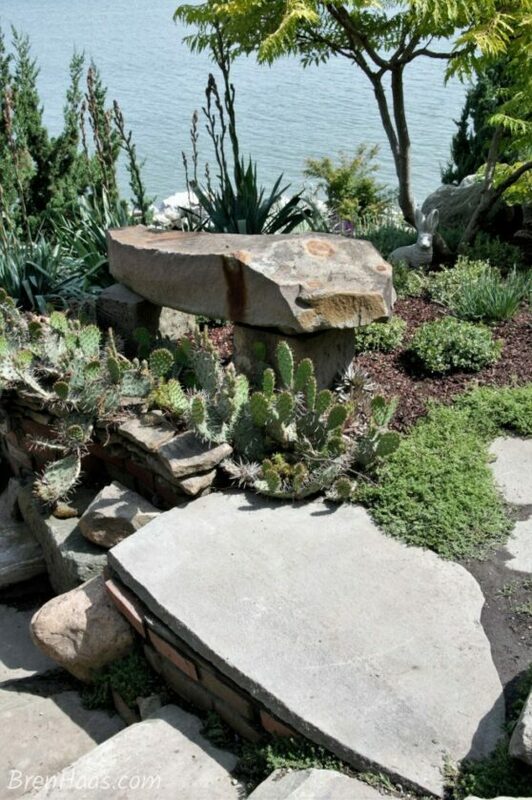 Over the years I’ve witnessed Prickly Pear Cactus sightings in some really creative places. Below is a photo I took while touring the Master Gardener Orchard – University of Nevada Cooperative Extension in Las Vegas. On the side of the Nevada University Greenhouse. In search of anything green in Las Vegas besides Lantana and palm trees, I found myself on the outskirts of town. I had no idea this was the Master Gardener facility. Luckily, I was spying through the gate as a master gardener was arriving to do the daily watering. I got to tour the garden with her as she watered. The prickly pear cactus plants stood out because they were sitting in the hot desert sun on the outside of the greenhouse. 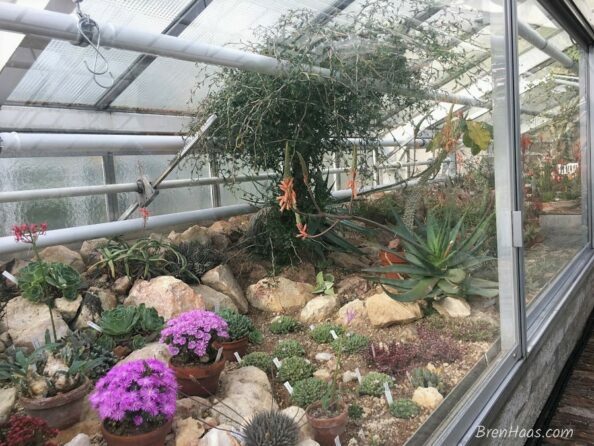 While visiting Germany with my husband we spend an afternoon at the Munich Botanical Garden. It was a cold autumn day so we spent most of the day in the greenhouses. I can’t get over how many cacti they had including the prickly pear cactus. At a rest stop in New Mexico while sight-seeing on Rt. 66 the prickly pear cactus could be spotted growing wild. 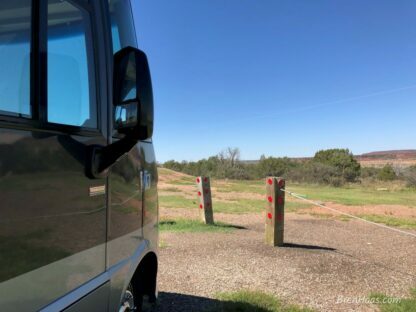 Below are some of the photos from the rest stop area my husband and I stopped to enjoy the view and stretch our legs. 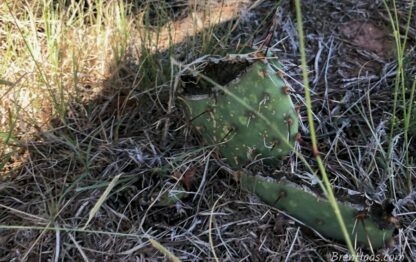 I actually got too close to the prickly pear cactus growing wild in some shade at the rest stop and it poked my foot. I had to have my husband get the thorn out... OUCH! Are you on Pinterest? I’d love it if you pinned this post over at that awesome network. I shared it on my boards at the link below. Share your story with me on my website contact page. 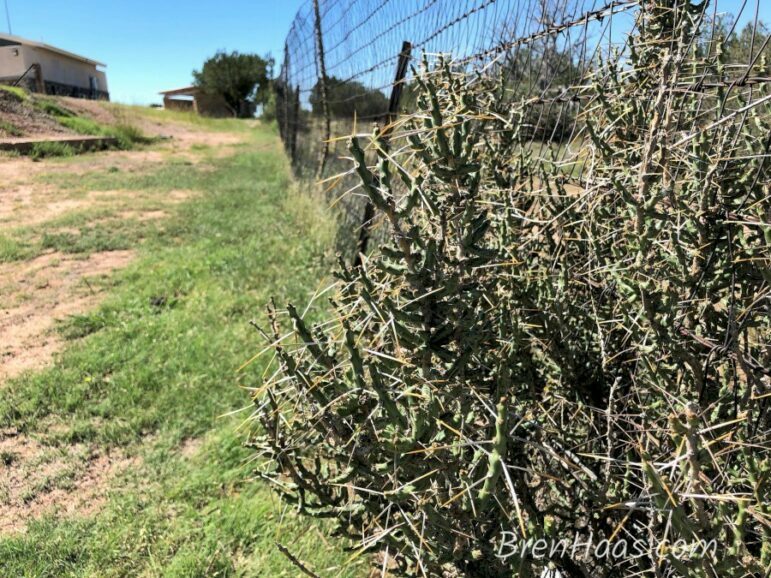 Don’t forget to share this prickly Pear Content on the social media links provided. Since moving to Texas I have to admit I have a weakness for the prickly pear. It grows quickly, has gorgeous flowers and some years lots of fruits. I never remember seeing it growing in gardens in the north. Thank you for stopping by my site Jenny. 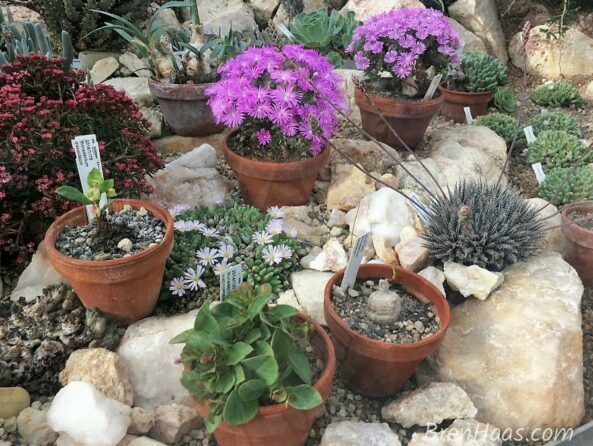 I love hearing about Texas gardens especially after spending some time down there last Spring. Amazing all the different things you can grow in that amazing state. I NEVER personally thought of growing cactus in Ohio until I got my cutting from the lLocal plant swap this past Spring. I was so excited to bring this home and give it a try in my dome. I have a piece of it outside to see if it will survive the winter. I’ll keep you posted! THis is a photo of my cactus pads I got from the swap. I am not sure why I had them floating in water in the dome but they really like it! Great information and pictures, Bren! Thank you Lisa! I appreciate the feedback and I really need to share more photos of my trip to Munich Botanical. You would love the houseplants in the greenhouse. Happy Gardening.